I loved this series and it's a darned shame they haven't made a follow up one, it's frustrating when they leave you hanging at the end. I'm guessing it just didn't sell well enough at the time. Great storyline, lots of characters which you soon find yourself loving or hating. It's got a combination of action and watching friendships develop. I'd recommend this to anyone who not only enjoys sports animes but for those that like lots of character development and interaction. One thing that usually grabs me for anime is good artwork. This one, while not great isn't bad. But I had forgotten I'd already seen this series before officially signing up with Crunchyroll. The story wasn't bad, but felt lackluster in making me want to delve deeper into learning more about the characters. It does pick up as the series progresses, but I have to say that for sports-centered anime it isn't one of my favorites. I find that Dear boys is a really similar anime to Prince of Tennis in certain ways. The fact that they are both sports related is obvious but when watching you come to realize even the characters are really similar. Anyone who has seen PoT would agree that they are almost based along the same idea with similar looking characters. The background music is really fitting with the techno beats to the games that they play and the soft music for the romance parts of the story, they really get the viewer into it. The only problem I found with this anime is that some of the voices did not seem to really match the look of the character but that is easily overlooked and I found that after the fifth episode it did not bother me anymore. The animation is not the greatest but do not let that fool you, it might be a bit choppy at times but overall its a great anime to watch. The storyline flowed quite nicely and the characters did not get to in depth over irrevelant things such as their pasts. They did have quite a few flashbacks to a particular incident but that is to reference the potential of the players and shows their passion for the sport. I felt that the other reviews for this anime did not do it justice as I almost passed right over watching it and I don't think others should be fooled by it. Even if sport anime is not your thing I would suggest giving this one a try. Its fairly short with only 26 episodes so far so theres nothing to lose but maybe 25 minutes of your time if you do not like the first episode. I have tried to be thorough in this review but I admit I know for sure that I have missed many things. It would be impossible to completely describe this anime and so I would recommend watching it for yourself. =) Have fun watching. This is the first sports anime i watched, saw it one day in TV and loved it. It may look slow but its great, if you are a true Basketball fan this anime will make you love it more. It doesn´t focus much on comedy like Slam Dunk but does more in the players and their hard work. I recommend that at least you watch it once and you´ll adore it, the music (same type of music of Initial D), the players relations(Aikawa and Mai) and much more. You won´t be deceppointed, trust me. I really like watching this anime. Unlike other sport anime like Kuroko's Basketball or The Knight in the Area, this anime has the characters focus on not just sports but also their everyday life. I do wish Crunchyroll would show this anime again since I would like to rewatch it again. There are bits that are a bit goofy, and the animation is very clearly both low-budget and dated, but it's a pleasant show with an enjoyable atmosphere and an inspirational story. The characters aren't the deepest, but they're still endearing, and that sentiment goes for the show as a whole. I had a great time with it. This anime is just great! I really loved everything about this anime. Something that I really liked was how it showed the power of will when you want to achieve something, and that sometimes you might lose, but from losing or making mistakes we also learn, and if we can overcome that we might even come back stronger, the point is never give up. Having read the manga before watching the anime, I had gone in with very low expectation because I had known this is only 26 episode series, yet manga had already continued well into Act II at the time and anime was out. I had thought the plot will be rushed and character development will be sacrificed, which turns out to be true on both accounts (it had included some events in Act II while story-wise, it had NOT progressed that far in the chronology yet). Even with it's flaws though, it had been adapted well enough to be enjoyed independently from manga (though I personally feel you still should read some manga in order to get some in-jokes or running gags since details available in manga are heavily omitted). I felt the anime is just average though it does have all the proper things to get you fired up like any good sports series. While I enjoyed it, it still is not too special of a series anime-wise (I enjoyed manga much more). I won't actively recommend this series to any person at any time, but if anyone has a sudden urge to watch something sporty but don't want anything long (Prince of Tennis has over 200 eps. Eyeshield 21 has 150, Slam Dunk has 101), this might just do the trick. 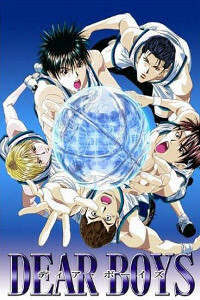 Dear boys is an anime about basketball, friendship, trust, overcoming obstacles and to win the championship. It is short and sweet, I wish it was longer coz I wanted to see their new player but can't make everyone happy. Aikawa Kazuhiko, an easy-going and smiling transfer student, tries to rebuild an ailing Mizuho High School basketball club back to its lost fame.